Raspberries are one of the most delicate fruits, with a tart flavor and velvety texture. The most common type of berry is the red-raspberry, but raspberries can also be black, purple, and golden. Raspberries are low in calories and carbohydrate and rich in fiber and heart healthy anthocyanins. A serving of raspberries provides about 15 grams of carbohydrate. However, along with other berries, such as blackberries and strawberries, raspberries are one of the 5 best low-sugar fruits for people with diabetes and those looking to follow a low-carbohydrate diet. The reason for this is because the portion size is generous and the carbohydrates are relatively low. One cup of raspberries contains a mere 64 calories and packs in a whopping 8 grams of fiber (more than 30 percent of your daily needs), making them an extremely filling fruit option. You'll also get just over five grams of naturally occurring sugar in a serving of raspberries. The glycemic load of raspberries is estimated to be three if you consume a one-cup serving. There is almost no fat in raspberries. A serving provides under one gram of polyunsaturated fat. Raspberries are not a good source of protein as they provide about 1.5 grams per serving. You'll benefit from important vitamins and minerals when you consume raspberries. Raspberries are an excellent source of vitamin C providing 54 percent (32 mg) of your daily recommended needs in just one serving. You'll also benefit from vitamin K (12 percent of your daily needs), and smaller amounts of folate, niacin, pantothenic acid, choline, vitamin E, thiamin, riboflavin, vitamin B6, and vitamin A. Minerals in raspberries include manganese (41 percent of your daily needs), and smaller amounts of calcium, iron, magnesium, phosphorus, potassium, zinc, and copper. Raspberries are rich in filling, heart healthy fiber. Fiber is the indigestible part of carbohydrate that can help to keep you full, pull cholesterol away from your heart, regulate bowels, protect against certain cancers and reduce how quickly blood sugar rises. Studies have shown that people who consume adequate amounts of fiber are at reduced risk of developing heart disease, cancer, and diabetes. In addition, people who eat a fiber full diet are at healthier weights. Raspberries' ruby-red color comes from health protective anthocyanins. Research suggests that anthocyanins may fend off certain chronic disease, including cardiovascular disease and certain cancers. Lastly, one cup of raspberries provides 50 percent of the daily needs for vitamin C. Vitamin C is an important vitamin that can help to boost the immune system, repair tissues, aid in wound healing and can have anti-aging effects. That funny looking hole in the middle of the raspberry occurs because when they are ripe the berry pulls away easily from its white core, leaving the characteristic of a hollow center. The hollow center makes eating berries fun, as kids often put them on their finger tips. Is it better to buy raspberries frozen? Raspberries are very susceptible to mold, therefore many of the raspberries grown are marketed to be frozen. Typically, frozen berries can contain more vitamins, minerals, and antioxidants then fresh because they are frozen at their peak freshness. Frozen raspberries typically last in the freezer for up to 12 months. Raspberries are imported from New Zealand and South America and, are harvested in Washington to New York State. The peak domestic season is from late May to November. When looking to purchase fresh raspberries, look for plump, firm, and fragrant berries, free of their hulls. Inspect containers for mold and avoid those that have begun to develop mold as these berries are starting to go bad. You can store fresh berries in the refrigerator uncovered, in a single layer on a paper-towel-lined plate for two to three days. Avoid washing until right before consumption, as washing too soon can cause the raspberries to spoil. Eat raspberries on their own as a snack or as part of a meal. Raspberries are a wonderful addition to smoothies, adding rich color and fiber. Raspberries beautiful appearance makes them a good garnish, too. They can also be used to add bulk and flavor to salads, side dishes, and as sauce for protein and desserts. Raspberries are also used to make various different pastries and desserts, including scones, muffins, pies, sorbets, etc. 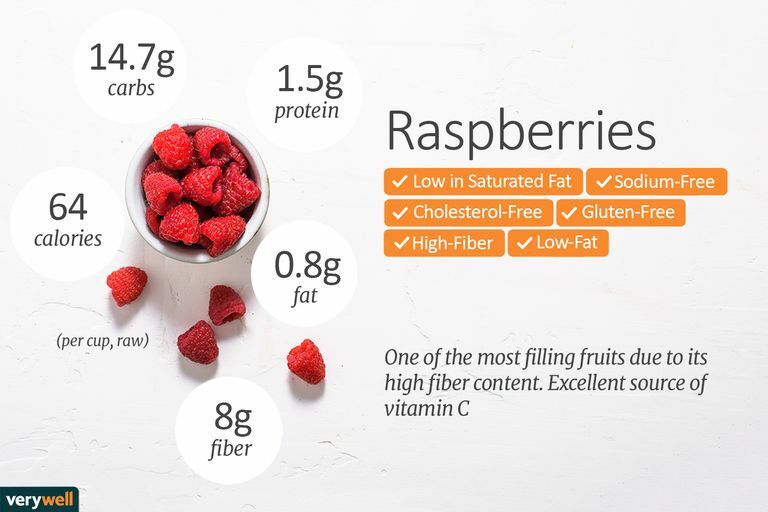 While these types of foods are not the healthiest choices, as they are often rich in calories and fat, raspberries can add filling fiber, perhaps enabling you to eat smaller portions. Use fresh or frozen raspberries to make healthy breakfast smoothies, heart-healthy salads, and side dishes, and thick, tart and tasty sauces to accompany your protein choices. Get cooking—you can't go wrong when adding these nutrient-rich berries to your meal plan. According to the American Academy of Asthma, Allergy, & Immunology, raspberries contain several known allergens. So it is possible to experience an allergic reaction after eating them. It is also possible that you may experience symptoms after consuming raspberries if you have no known allergy to them but are allergic to other types of berries. However, the organization notes that cross-reactivity between berries is complex. It is important to discuss your berry allergies with your healthcare provider if you suspect that you are allergic to raspberries.